Some foods carry so much cultural baggage, that no matter how bad they are, a little part of you wants them anyway. I don’t think I can move along any further with this blog without acknowledging the meal that is so Soviet that it should have been banned by the new government in 1991. Nothing about these sausage packages would give any indication of what the sausage is actually made of. I think the producers are trying to distract you from the very fact that the ingredients are…well, you don’t want to know what they are. It doesn’t take long to distract the sausage-buyer though – “Ah, it's so easy to deceive me!..I'm grateful to be deceived!” – as a line in a poem by Russia’s most famous poet, Alexander Pushkin, reads. Foodies, skip the next line, or go eat a turkey sausage, because you’re not going to like this: I, too, occasionally close my eyes and buy a packet of sausages, bring them home, cook them, and then eat and enjoy them, too. When I was a kid, granny would sometimes make sausages with stewed cabbage: she’d cut up the sausages and distribute them among the cabbage in the faint hope that we might accidentally eat some cabbage, too. We were no fools, and never did. After digging and consuming all the delicious sausage bits, we would spread the cabbage thinly on the plate and, content with the immaculate execution of the “cunning plan,” would put our heads on our arms and say in a low voice, slowly: “bol’she ne mogu!” (I can’t eat any more!). Then granny would try and convince us to have some of the cabbage, we would make puppy eyes and look all cute, and she would eventually give in. This time though, I have to make and eat not just the sausage, but the cabbage, too, as that’s what the recipe calls for. Worse still, I have to somehow feed it to my husband. I fear failure. Lucky for him, the cabbage shrunk a lot during cooking so the sausage/cabbage ratio worked in his favor, and I got away with it. We also discovered that the Soviet sausages didn’t have any MSG in them. What’s the point of junk food without MSG in it, I ask? That would be the one ingredient I would look for on the sausage cover. But that won’t be for another year or so. Shred cabbage and put in a saucepan with a tablespoon of butter and ½ cup water or broth. Cover and let simmer 40 minutes. In the meantime, slice the onions and brown them in another tablespoon of butter. After the cabbage has cooked 40 minutes, add onions, tomato paste, vinegar, sugar, salt, petter and 1 bay leaf. Simmer until tender, about 10 minutes. Melt last tablespoon of butter in a skillet and add flour until it is toasted. Add cabbage to the toasted flour, and bring to a boil. Sauerkraut can be used in place of fresh cabbage, but in this case, you do not need to add vinegar when cooking it. 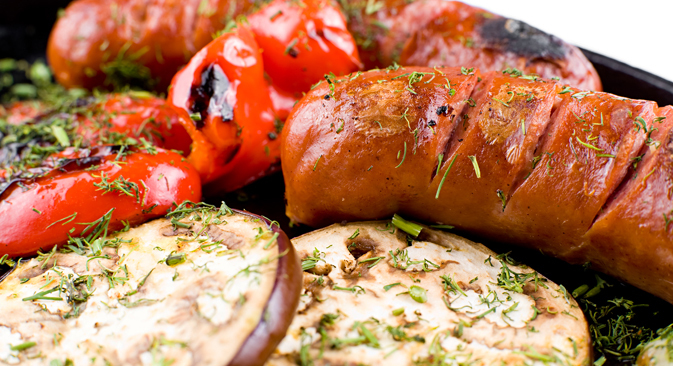 There are several different ways to prepare sausages. They can be boiled in lightly salted water and served with mustard or grated horseradish. They can also be fried with tomatoes. To do this, cut sausages crosswise into 3-4 pieces, fry them in a pan with butter for 2-3 minutes, then add tomatoes that have been thinly sliced and sprinkled with salt and pepper and fry for two more minutes. Grated garlic can be added as well, and the fresh tomatoes can be replaced with canned tomatoes or tomato paste. Sausages can also be taken out of their skins, sliced and then fried.